Energy & Fat Metabolism. Enhances Metabolism. Improves Exercise Capacity. Acetyl-L-Carnitine is a stabilized & more absorbable form of the amino acid L-Carnitine. Acetyl-L-Carnitine plays an important role in protecting & supporting brain & muscle function. As an antioxidant, Acetyl-L-Carnitine protects neurons from damage caused by superoxide radicals. 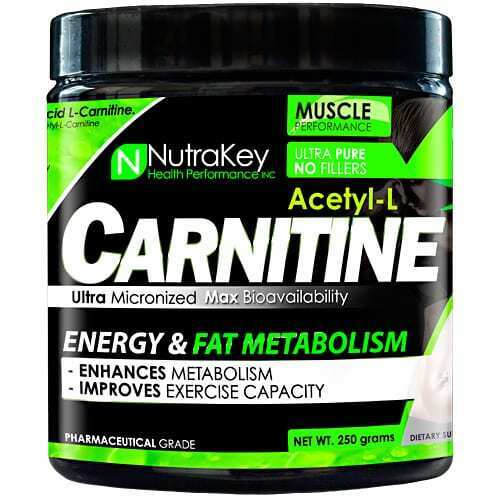 Improves exercise capacity and fat loss: Acetyl-L-Carnitine facilitates the metabolism of fatty acids for energy generation. A greater reliance on fat for energy can result in a sparing of muscle glycogen, an enhancement of exercise performance, and a reduction in stored body fat. Acetyl-L-Carnitine has a profound effect on endurance and exercise performance that works by reducing the respiratory exchange ratio and decreasing lactic acid accumulation in muscles. This results in extended exercise capacity before the onset of fatigue. Carnitine comes in both L and D-carnitine forms. However, only the L form is biologically active, the D form is completely inactive. In large quantities and particular conditions, the D form may inhibit the utilization of L-Caritine, Nutrakey L-Carnitine supplements no synthetic D-Carnitine or DL-Carnitine. D-Carnitine and DL-Carnitine are less effective than L-Carnitine, D-Carnitine and DL-Carnitine are not recommended because of their adverse physical side effects. Acetyl-L-Carnitine may be effective for depression experienced by the elderly. A preliminary trial found that Acetyl-L-Carnitine supplementation was effective at relieving depression in a group of elderly people, particularly these showing more serious clinical symptoms. These results were confirmed in another similar clinical trail. In that trail, participants received either 500 mg three times a day of Acetyl-L-Carnitine or a matching placebo. Those receiving Acetyl-L-Carnitine experience significantly reduced symptoms of depression compared to those receiving placebo. At least two other clinical studies of Acetyl-L-Carnitine for depression in the elderly have reported similar results.